We hope that this newsletter finds you well. The last newsletter was sent out near the start of August. At that time, a near-record wet June and fairly wet July had just been completed in Florida, and the writing was on the wall regarding an active Atlantic hurricane season. First, let's talk about the high rainfall totals that accumulated over the wet season, which, in Florida, runs from around the beginning of May until the end of October (shorter season on the panhandle and other portions of the north of the state, longer in the south). Rainfall for that period, as shown below, was at least normal statewide and up to twice normal in the far western panhandle and along the far southwest coast. As highlighted later in the newsletter, one observer in the Naples area recorded nearly 88 inches of rain during that period. Especially in the second half of the rainy season, rains from disturbances in the tropics were a major contributor to the high totals. In Florida, this hurricane season has been the most impactful since 2005. On 31 July, Tropical Storm Emily quickly formed just outside the Tampa Bay, making landfall on Anna Maria Island in Manatee County. In late August, Hurricane Harvey traversed the Texas Gulf coast, and its outermost rain bands affected the panhandle. On 10 September, Hurricane Irma made several landfalls on the Keys and southwest Florida, bringing very heavy rain totals of up to 25 inches to a large swath of the peninsula. During Irma, CoCoRaHS observations have proven to be invaluable, as many official NWS stations (both on the Automated Surface Observation System (ASOS) and the COOP network) were knocked out of service, rendering many of those rainfall totals incomplete in the central and southern parts of the state. On 7-8 October, Hurricane Nate made landfalls on Louisiana and then Mississippi, and its rainfall was seen as far east as the Big Bend but was heaviest on the far western panhandle and westward from there. A consequence of the tracks of these tropical entities is that portions of the Big Bend and central panhandle are now considered abnormally dry in the 90-day time-frame, which is reflected in the latest US Drought Monitor. 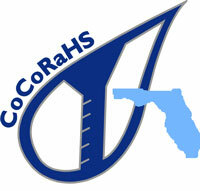 An overall point is that CoCoRaHS observers continue to be important team-players in documenting the hydroclimatic variability of Florida and elsewhere in the United States, Canada, and the Bahamas. As the dry season continues to take hold across Florida, we'd like to implore you to continue reporting on a daily basis - even if it's zero for several days or even weeks at a time. It's important to know that, and document it. The rest of this newsletter will be dedicated to highlighting some more statistics, looking ahead at winter, and giving some reminders about best practices. You may remember this article from the Summer 2017 newsletter, but this information bears repeating. At some time or another, most of you will travel away from home for a period of time for vacation, preventing you from checking your gauges every day. When you return, you may find that rainfall has accumulated over multiple days. We have noticed that many of you still enter these multi-day totals in the standard Daily Report. Doing so, however, is not the correct procedure. In these instances, you should enter a Multi-Day Accumulation Report. For example, let us assume that your regular observation time is 8:00 AM and that you leave for a vacation on the morning of May 20th, before your usual observation time, and return in the afternoon of May 26th. Therefore, your next daily observation would occur at 8:00 AM on May 27th. At that time on the 27th, you find 2.15" in your gauge. Following this example, you'd enter a Multi-Day Accumulation Report in the manner shown in the graphic above. If you ever have any questions about this or any other procedure, please let us or your regional or local coordinator know. 1 August 2017, Naples 9.0NE, Charlotte County (CR-41): "This is the most I've ever dumped in 1 day, this is the worst flooding since Fay in 08. Most of the rain fell in the morning and nighttime, where there was training thunderstorms during the night, which caused heavy rain to fall, about an inch of rain fell during the night, and 4 inches of rain fell during the morning and daytime, I have filed 2 significant weather reports on this." 1 August 2017, Bradenton 10.8SE, Manatee County (MA-10): " Tropical Storm Emily made landfall just north of our location in Lakewood Ranch. Heavy rains during the morning and early afternoon hours accompanied by strong winds and gusts. However, our neighborhood did not receive any major damage. Small branches from trees is all the damage that is visible." 11 September 2017, Melbourne Beach 3.9SSE, Brevard County (BV-11): "The top (funnel) of my gauge blew away during hurricane Irma so I do not know how accurate the 4.75" is. Found top of my gauge buried in sand 10' from my gauge." 11 September 2017, Tampa 5.1S, Hillsborough County (HB-10): " Hurricane Irma passes due east of Tampa at 3AM EDT, with the winds being the greatest cause of damage, with the rainfall much less than I expected, at my South Tampa location this day. After surviving Florida hurricanes since 1954, this was one I won't soon forget. The good news: My house, home, and pets, as well as myself, survived with little physical and material damage. Yet it was the ongoing storm anxiety and stress that suffered most." 8 October 2017, Pensacola 1.9NE, Escambia County (ES-26): "Still spitting occasionally and still breezy, albeit not like a few hours ago......No real damage from Hurricane Nate, other than small dead branches and leaves on all low surfaces...All rainfall began in earnest about 8PM last night....All's well." 29 October 2017, Delray Beach 1.6WSW, Palm Beach County (PB-61): "Tropical Storm Philippe soaked our area with rain beginning around noon on the 28th through early this morning." As dry season begins to take hold over most of Florida, rainfall will be scarce. Indeed, for many days on end, no rainfall may fall. During such times, it may be tempting to skip reporting the amount that fell (or, more accurately, did not fall). We notice that some observers do this at all times of year, even during the wet season, and, unfortunately, users of these data cannot assume that a non-report is a report of zero. Therefore, the observation record of an observer who fails to report zeroes is not as useful as the record of one who does. Moreover, knowing when no rain has fallen is important for monitoring drought. Let's say you're this observer and measured zero rainfall each day during the first week of October. Using this form, you could enter, after the fact, all those zeroes by clicking "0.0 Precip" for each of those seven days. The form is accessed from the "Enter New Reports" menu on the left-hand side of the observation entry screen. Recently, NOAA's Climate Prediction Center (CPC) issued a La Nina Advisory. La Nina refers to the negative (or cold) phase of the El Nino-Southern Oscillation (ENSO). How relatively cool or warm waters in the equatorial Pacific Ocean are is a reflection of the ENSO phase that is in place. During a La Nina event, sea-surface temperatures (SSTs) are anomalously negative in the equatorial Pacific. The diagram below shows SST anomalies over time in the equatorial Pacific; note that these anomalies have grown increasingly negative more recently. Most model projections point to a weak La Nina that will continue through the winter, and official forecasts from CPC and other agencies follow these projections. ENSO is important because it influences weather patterns at distant points around the world. In Florida, La Nina events are associated with warmer- and drier-than-normal conditions. However, there have been exceptions, especially in the case of weak La Ninas. Below is the official CPC forecast for winter. Condition Monitoring report: Try it! A more recent addition to the types of reports that CoCoRaHS observers can file is the Condition Monitoring report. Details are given about here, but the gist is that you make note of conditions of everyday things around you. For instance, you might note that your lawn is parched from a recent lack of rain and not irrigating it. You can note that this in a Condition Monitoring report. These reports are compiled and are used by climatologists and hydrologists to develop such products as the weekly US Drought Monitor, which keeps tabs of drought across the United States.